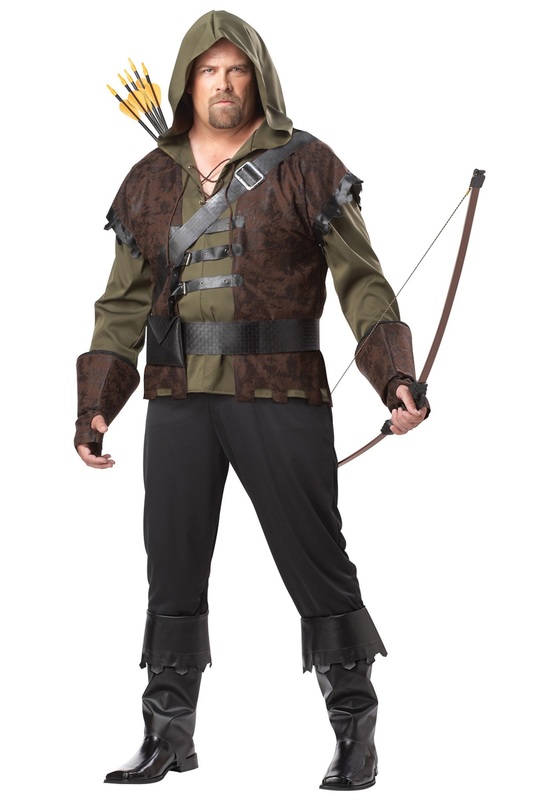 Remember when the Merry Men of Sherwood forest wore tights? Oh, man was that a weird time! Robin was going through his experimental phase with the singing, and dancing, and his friends were just trying to be supportive. With poor Maid Marian locked in her metal chastity belt. Can you blame him for trying to cut loose a little though, just two years before he was Robin Hood: Prince of Thieves. His life was difficult, and it looked like he bathed in sand instead of a stream. But that was a great movie too. How could it not be with Morgan Freeman? Needless to say Robin Hood has had a few different looks over the years. But somethings always remain the same. The forest green shirt, the bow, and quiver. And let’s not forget the hood. It would be silly to call him “Robin Hood” if there was no hood for a dramatic reveal. Well this year you can become the next in a long line of Hoods. Put on this Plus Sized Robin Hood Costume, and become the outlawed Lord of Loxley. It of course comes with the classic forest green shirt, and hood for a dramatic reveal. Become the lover of Maid Marian. Become the protector of the people of Nottingham, the Sherwood forest, and Loxley. Just don’t forget to practice up on your archery skills. It is hard to be known as the best archer in England if you can’t let loose an arrow that can split another arrow.